We take credit card orders for Gena's Famous Chantilly Cream mix through Paypal, it's fast, easy and secure. Gena's Famous Chantilly Cream is packaged in liquid mix packages that you later mix up at home to create a delicious dessert or fruit dip for any occasion. Please allow 7-10 business days for delivery. Shipping is from $5.50 to $10 depending on your quantity. Shipping and sales tax will be added to the price of your order upon checkout. We ship direct to you via UPS after your order is received. Gena's Famous Chantilly Cream mix package is sold in a minimum of four packs per bag for $20. To order, click the add to cart button below and check out through our Paypal shopping cart system. If you have any questions regarding your order please contact us. 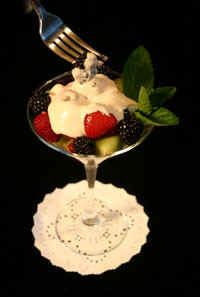 Gena's Famous House of Chantilly Cream mix can be purchased at wholesale cost in minimum quantity of 30 packs per case. You must provide your wholesale number or resale license in the notes section of your order. To prepare Gena's Famous Chantilly Cream, just add one pack of Chantilly Cream mix, to one pint of sour cream and one tablespoon of sugar. Mix until well blended and serve chilled. Each pack will yield one pint of Chantilly Cream. If Chantilly Cream is not to your satisfaction, we would be happy to replace your order or give you a refund.